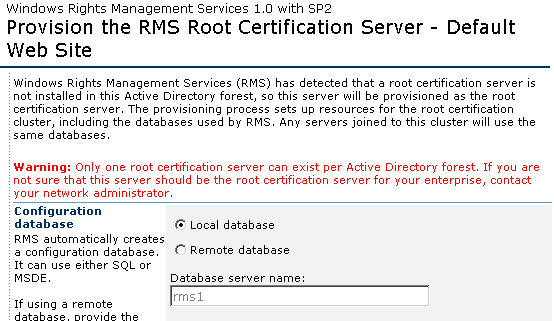 When installing Windows Rights Management Services (RMS) 1.0 with SP2 onto an Active Directory infrastructure with an Enterprise Root Certification Authority and one which may have had RMS deployed previously, you might be prompted with a warning about a Root CA, or RMS assumes that another Root CA already exists. 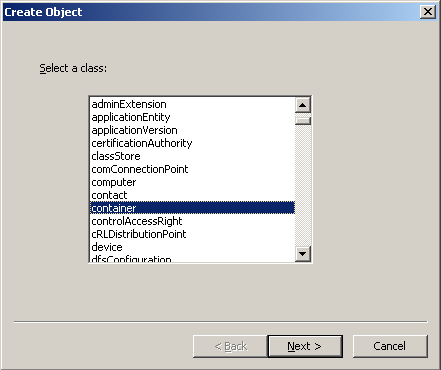 This article will attempt to discuss the internals of and how it integrates with Active Directory. Windows Rights Management Services (RMS) is Microsoft’s implementation of digital rights management (DRM). Much like DRM for audio and video protection, RMS is aimed primarily at the office user and the protection of sensitive information. Some of its features are, document encryption, restrict copy, restrict forward (for emails), expiry on documents. RMS integrates with the Microsoft Office Suite of products as well as other RMS aware applications. It is quite typical (unfortunately) that many production environments are treated as a test bed for many installations. In this instance you may be faced with a scenario where you will need to deploy RMS into an environment that hasn’t perhaps been controlled with a proper change management policy or a test environment where staff can "play". and click OK. Adsiedit.msc opens. 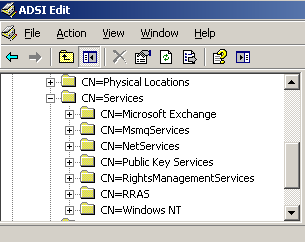 In the Select a well known Naming Context dropdown, select Configuration and click OK.
A normal configuration should look as follows, but in your case you’re probably missing the CN=RightsManagementServices container. We will need to recreate this container. Ensure that the account you’re logged in on has Domain Admin rights. 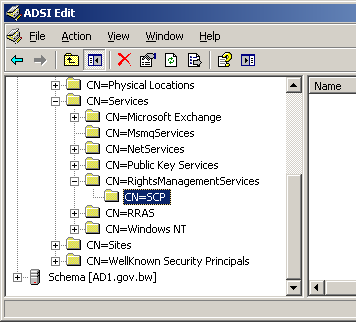 Your ADSI Edit window should look something like this, showing the newly created containers. At this point go back to your RMS administration website and refresh the provisioning page. You should notice that the warning has disappeared. RMS may assume that a Root RMS CA already exists and may try to install the current instance as a Licensing server, not as a Root CA. 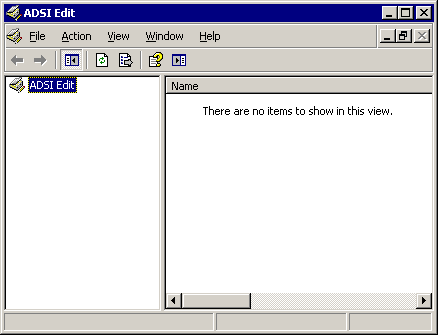 This usually occurs when a previous installation of RMS was deployed and then either forgotten about or removed. Typically these issues arise when systems administrators or engineers are allowed to deploy “test” solutions into the production environment without full knowledge of the artefacts which are left behind. Warning! RMS did not detect the service connection point in Active Directory. 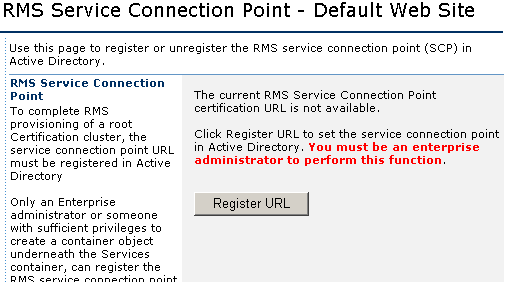 RM clients will not be able to discover the RMS service until the service URL is registered in Active Directory. Please click RMS service connection point link below to register the SCP. To get around this warning, you should click on the RMS service connection point (SCP) link in the left hand margin and Click on the Register URL button. Once you go back to the Administration page you may notice that the warning is still showing. Give it some time to update the changes in AD. Depending on your environment it may take some time. Be patient. Refresh the administration page periodically to see if the SCP has been updated. Note: The standard refresh methods won’t work, so you will need to leave and enter the page before the changes will be reflected. Also, ensure that you give enough time for the SCP to replicate throughout your AD infrastructure or force a manual replication. Please note that [YourClusterURL] is a placeholder for whatever you called your cluster whilst configuring the Root RMS server. 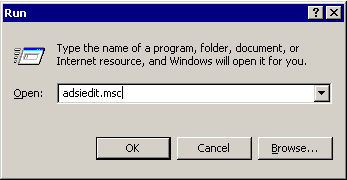 When you uninstall RMS these databases are left behind on the SQL server. When reinstalling RMS, RMS detects the existence of these databases and will give you the option of reconfiguring them. The reconfiguration process, will clear and reconfigure the DirectoryService and Config databases and create a new Logging database: DRMS_Logging_[YourClusterURL]_80_01. If you want to start from scratch however, it is safe to delete all these databases. RMS will recreate them again during the installation process.